Life Before the Dinosaurs: Nectocaris. 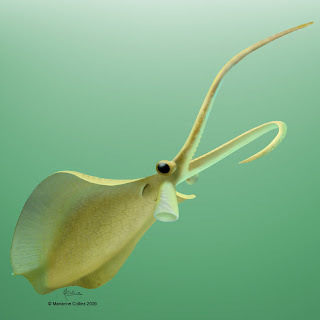 Nectocaris was a weird creature which might have been a cephalopod. The image on the left shows an earlier idea of Nectocaris, but now they believe that the image on the right would be what Nectocaris really looked like. When Walcott first discovered Nectocaris in the Burgess Shale, he never had time to study it. Then, later, someone described it to be an arthropod. Last year, in 2010, someone described it to be an early cephalopod. Fossil evidence shows that mud must have gotten into the gills, so Nectocaris was probably a nektobenthic creature, meaning that it lived at the bottom, but swam above the sediment. Nectocaris was probably either a predator or a scavenger, grabbing food with its two tentacles. Scientists aren't exactly sure if cephalopods started out with two tentacles then they evolved more over time, or if Nectocaris's two tentacles were just made up of its other tentacles. I came here via Pharyngula. I totally *heart* you and your mom. Thanks for all the cool info! What is your favorite giant anthropod from the Carboniferious? Mine is the Pulmonoscorpius kirktonensis! This is awesome. 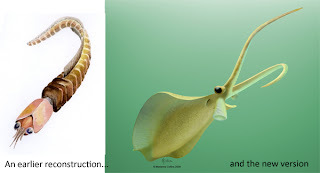 I've been fascinated by Burgess Shale creatures for years, and this is a very cool blog. Good work. Whoa! Very nice blog. I hope these fantastic creatures keep your interest your whole life. Very cool blog. Your images are well chosen, and fit well with your comments. This is a wonderful blog! I love learning more about our world, from ancient times to our own times. There is so much to learn and discover! I am most interested in birds, but I like to learn about everything else, too, so I can understand how it all fits together and how everything has changed over time. Sometimes I wonder about what scientists will be studying 100, 200, 500, 1000 years from now. What do you think? Here's me sitting in Amsterdam, admiring your blog! Great stuff! Thanks! One of the things will probably be new fossils that they found over time. Tomorrow's post is going to be Sarotrocercus. It's pronounced sare-ah-tro-sare-cus. Also here from Pharyngula, and I love this blog! Cambrian creatures are awesome. Great bog. I will follow. Very educational and fun. Dinosaurs are dull, all the animals that live before them in the Palaeozoic are far more interesting. I have a passion for brachiopods. I am looking forward to seeing what else you write, especially the weird Cambrian arthropods. Very nice. Do you think that Nectocaris is related to the Tully Monsters? I'm another traveller via Pharyngula. I think your blog is awesome and you are a fantastic kid who will grow up to be a great scientist some day. I will follow your blog with great interest. Warmest regards from an old lady in Sweden. Thanks! I didn't know Anomalocaris survived to the Ordovician, or that there were DEVONIAN anomalocarids in Germany! I didn't know there were Silurian anomalocarids either, because they must have survived the Silurian. And isn't it crazy they survived the second-worst mass extinction ever? So they must have been very well adapted. Great stuff!! I know almost nothing about Life before the Dinosaurs. I love to study physics, so I could tell you LOTS about how the stars and planets formed, but no so much about the evolution of creatures. But your explanations and pictures here are really great! I will make sure to have a look at what else you have to tell me on this excellent blog - who knows, you might yet pursuade me that pre-dinosaur creatures are more exciting than stars and planets. I too came her via Pharyngula. Congratulations on your wonderful blog and keep up the good work. By the way, as an Illinois resident and some-time collector of Mazon Creek fossils, my favorite creature from the pre-dinosaurian era is the Tullimonstrum gregarium, also known as the Tully Monster. Sadly, I've never found one myself but I'll keep trying. I came here via Pharyngula. Your blog impresses me greatly. You´re not a seven year old kid showing pretty pictures of your favourite beasties, you´re a seven year old fledgeling scientist who completely amazes me with the level of knowledge you seem to have (I´m a complete ignoramus who is seriously dwarfed by your expertise when it comes to arthropods, so I wouldn´t know one from the other anyhow) and the way you present your posts. Smashing! And your mother rocks. for what it´s worth, you now have a fan in Leiden, the Netherlands and I´ll spread the word! I´m an archaeologist, and so are most of my friends, so we fall woefully short in scope, but most of them and myself are eager to learn and this weblog seems like an excellent place for it. Congratulations on a very nice blog, ABC. Fun blog! And a very nice list of books in your profile. Have you read Bugs Before Time by Cathy Camping? (Sorry, I'm a librarian and it's what we do). Great blog. I've always been a fan of the later creatures, but these bizarre animals are a lot of fun. I especially like this one, and the fact that our understanding of its body shape has changed with better data. I know almost nothing about these amazing, weird creatures.. thanks for sharing! I agree with two of your commenters above: Blog about Tully Monsters! Mom: Seek out a mentor! ABC has a great future ahead of him! Thanks! No, I haven't read Bugs Before Time. I'm blown away by this blog, very well done and kudos to your mother! Keep up the good work. I'm looking forward to your post on those ancient back-strokers. I love your blog! Thanks for sharing. I came here at the recommendation of Dr. PZ Myers. I love your blog and the great graphics. You and your mom are doing good work. You have a very curious mind. I will look for more interesting creatures in your blog in the future. I also came here via Pharyngula, and I have to say I am quite impressed. You and your mother make an excellent team, and your curiosity runs deep. Keep up the questioning and analysis and you will achieve even greater things. Myself, I am interested more in physics and maths than biology, but I never had your curiosity as a youngster. Rock on, little dude! Reading about your blog, I decided to see type of pre-historic bugs where around in my part of the world, South Africa. And I found out that even today there are some that would not look out of place in a monster movie. http://www.damninteresting.com/giant-carnivorous-centipedes/ has a couple of videos of centipedes catching and eat bats and mice! Very nice work! I have vague memory that I've read somewhere that they were able to figure out the colour of some of these Burgess Shale creatures. The texture of their skin was such that only one colour was reflected. Some bug colors work that way too. Can't remember if it was nectocaris or some other, though. If I can make a suggestion, I've noticed that with many you give some ecological context - other species they lived with, what they ate or what ate them - and I think something really great is if you also had articles on those other species mentioned and links between the articles. For example, the post on Doryaspis mentions Dunkleosteus as one of its predators and there's a separate post for Dunkleosteus. You could have the name "Dunkleosteus" in the Doryaspis article link to the Dunkleosteus post. Do you think this Nectocaris critter could have actually burrowed in the muddy bottom and pounced when it sensed the vibrations of nearby prey (since was thought to have mud in its gills)? And yet another pharyngula reader here (a Swede currently in Germany). I was pleased to no end finding this article. I instantly adored the look of the Nectocaris when the new visualization of it was posted on Scienceblogs ages ago. I kept meaning to look deeper into it, but forgot to as I got distracted with moving. Thanks for the interesting info! I am definitely going to follow this blog, and read all the pages posted so far: while I always have loved dinosaurs, I love the earlier critters and plants even more so. Also brought here by Pharyngula (I'm an American living in Croatia). My compliments to you (and mom) on a fantastic blog! I'm not an expert or anything, but I too find these Burgess Shale arthropods quite fascinating. Today's Nectocaris entry is lovely, but one of my personal favorites is Hallucigenia (which I see you featured in May). Keep up the good work! Great blog. Keep it up!!! Wonderful blog, love your content. I will be bookmarking and returning regularly. Keep up the amazing work! Things became busy here today. PZ has some interesting followers. You should be proud LBC! Visiting here from Pharyngula, based in Cape Town, South Africa. My favourite Cambrians are Trilobites. I've learnt a lot of new things on your blog and will be feeding it into my reader from now on. Keep it up! A very cool blog indeed. Great blog! I hope you continue to be curious. I also came here via PZ's blog. Make sure you answer this one from above: "What is your favorite giant anthropod from the Carboniferious?" And keep up the good work. My favorite giant arthropod from the Carboniferous is Arthropleura. Hi! Another traveller via Pharyngula, living in Australia. Great blog, and I'm looking forward to being educated by your postings. WOW!! Arthropleura is my pick too. A little Mazon creek history! Mrs.Lucy McLuckie collected the 1st fossil in North America in 1953 from pit#(Sorry,can`t say in public do to crooked fossil dealers). That 5 inch baby leg is now in the u s national museum!! By 1983 only E.S.R.,myself and W.D.Ian Rolfe seen all the N.Am. material. In Aug.1982 I located 5 more fossils in Yale`s collection stored under horseshoe crabs. Boy was Ian happy! (That`s the super short version) E.S.R. died Jan.22,1983 and everythings been down hill since!!!!!! !